XTC: FOSSIL FUEL: THE XTC SINGLES: 1977-92: 1996: 5 STARS OUT OF 5 STARS: A UK release. I was looking and in the US XTC never had a Top 40 album and only one of their singles even hit the Hot 100- The Mayor of Simpleton #72. They weren’t even all the successful in their native UK with only 6 Top 40 hits. They were ahead of their time and always in a state of change. I have their more well known albums I am going to get into this band in the upcoming year. This is a great starting point for those interested. Also I would recommend the documentary- XTC- This Is Pop. DWIGHT YOAKAM: DWIGHT SINGS BUCK: 2007: 4 STARS OUT OF 5 STARS: The album was released on Dwight’s 51st birthday. 15 covers of Buck Owens songs. Without question Buck and The Bakersfield Sound has been a heavy influence on Yoakam’s career. He does a good job here covering his heroes music. 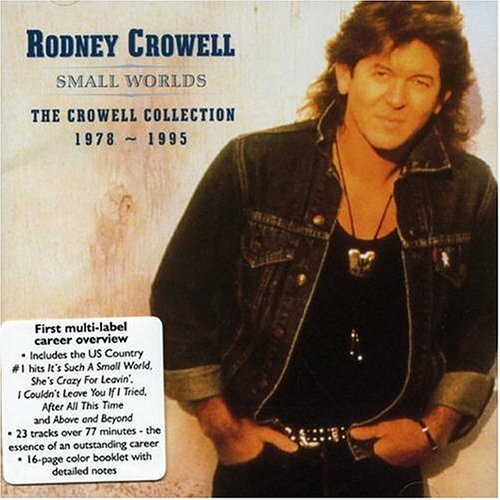 RODNEY CROWELL: SMALL WORLDS: THE CROWELL COLLECTION: 2002: 4 STARS OUT OF 5 STARS: A greatest hits collection up to the mid 90’s. He had 5 #1’s off of his Diamonds & Dirt album in 1988. These are very good, fine written songs but to me Rodney Crowell started to hit paydirt in 2001 with The Houston Kid album when his songwriting turned more introspective. 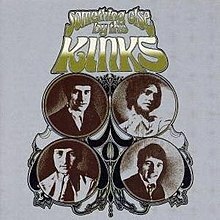 THE KINKS: SOMETHING ELSE: 1967: 5 STARS OUT OF 5 STARS: My second favorite Kinks album. Contains their best ever song- and one of the best songs ever period- Waterloo Sunset. Dave Davies contributes Death Of A Clown. David Watts, Love Me Til The Sunshines, Lazy Old Sun, Afternoon Tea are other standouts. The album sold poorly. Life isn’t fair. XTC has a number one album here in New Zealand – 1980’s Black Sea. White Music – Think I listened to it once. English Settlement – I have two tee-shirts with the White Horse of Uffington on. Think that says volumes. Skylarking – Well good. We should all wear daisies. Bootlegs – They did a tour of US radio stations and did medleys e.g. – Love on a farmboys / senses working overtime / Grass – with banter and good chat which are not to hard to find. Thanks for the mini-reviews! My first XTC was Skylarking which I love- I have four of their albums- I feel driven to listen to all their stuff. I think I am going to start at the beginning and work my way through! Andy Partridge famously had a massive run in with Virgin Records. I think he felt they had not promoted Nonsuch enough, so he had a strop and a half and refused to release anything. XTC did release stuff under pseudonyms, the best being the Duke of Stratosphere psychedelic stuff – the worst being the Christmas singles – Three Wise Men. During that time one of the band had to take on mini-cab driving to make ends meet. When they were finally released from the contract, they, and I think it was just Partridge and Moulding left, Dave Gregory was around but not part of the band, recorded Apple Venus and Wasp Star. I thought ‘Your Dictionary’ was about Virgin, but it was a really spiteful and massively strong divorce song. Dave Gregory later joined Big Big Train and provided the background to the first song I liked by them – The First Rebreather. Based on “actual events”, it tells the story of the navvies who were tunnelling under the River Severn (between England and Wales) for the railway, who managed to release the water from an artesian well underneath thus flooding the diggings. A rebreather is the old name for a diver. This guy went in and closed the flood gates, in darkness, to allow them to continue. All with swirls of Hammond organ! Andy Partridge has provided a couple of songs for the new Monkees album (new – honestly! ), but I have not heard them yet.